A Singaporean in Paris, the popular musical revue from 2010, was restaged this year by Sing Theatre and starred homegrown talent Hossan Leong in the title role. Leong also starred in the original. The 2014 run was from March 11th to 23rd, at SOTA’s Drama Theatre. A Singaporean in Paris tells the tale of a Singaporean boy, KC (Leong), who arrives in Paris to pursue his dreams of performing, only to meet like-minded fellow migrants, who all find work in a cafe. Together, they encourage each other, lend a shoulder when times are bad, and function as each other’s support system through their trying times in Paris. Although this production was slightly less comedic than Sing Theatre’s previous offering of A French Kiss, A Singaporean in Paris still had plenty of laughs and wit to keep the audience highly entertained. Some of the songs were infectiously funny whilst others were moving and touching, adding up to a very vibrant and lively revue that explored all facets of emotion. The melodies of the catchy songs along with the superb singing surely kept the audience tapping their toes throughout. Along with Leong, the rest of the cast – Vicky Williamson, Peter Ong, Mina Kaye and Linden Furnell – all performed magnificently, hitting all the right notes and dancing their hearts out. Furnell especially shone in his tap number, which included him doing a split – successfully! Leong did double duty and directed this production. The staging was well paced and although the set was small and for the most part bare, Leong made full use of the cast’s comedic timing, antics, skills and musical ability to give us a complete and delightful revue experience. 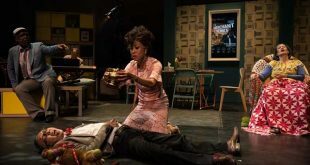 Try and catch A Singaporean in Paris the next time it’s restaged if you missed it this time around, as it’s not only a testament to how talented Singapore-based artists are, it’s also a lesson on being a foreigner in a strange land. As the cast sings 'Forever Young' to close the show, heartstrings are definitely pulled, as we all have parents or know people around us who are growing older with each day. And that includes ourselves.